Do lichens have a symbiotic relationship with fungi? 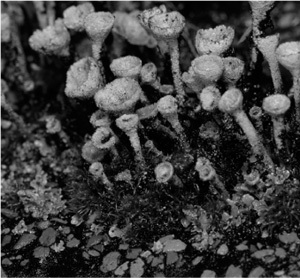 Yes, lichens have a symbiotic relationship with fungi and were one of the first organisms recognized as having such a connection. Because the fungus has no chlorophyll, it cannot manufacture its own food, but it can absorb food from algae. The algae is a layer of usually single-celled plants near the surface, just below a jellylike layer of fungal hyphae (for more about hyphae, see this chapter). Lichens such as these cup lichens are organisms that can grow well on bare ground, rocks, and bark. They are formed from two organisms living in a symbiotic relationship: a fungus and a photobiont (also called a phycobiont).